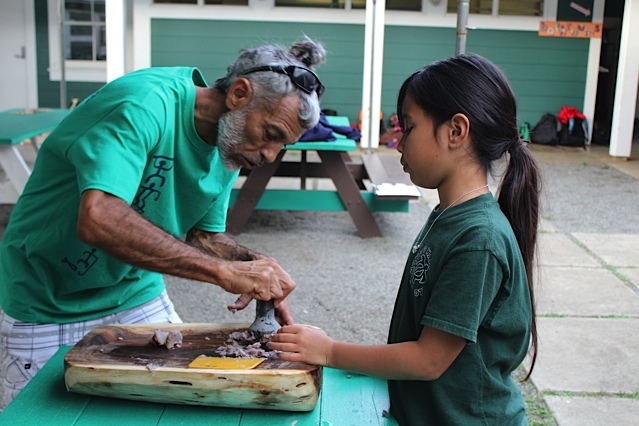 ʻAnakala Ricky Bermudez works with one of our students to kuʻi kalo (pound poi). Do you enjoy working with keiki and ʻohana? Would you like to volunteer with our program? There are various facets of programming that we could use kōkua with - daily after-school program, HMKF site projects, etc. If you volunteer with our cultural-based programs and workshops, your hours can be counted toward your KS Scholarship requirements. If you are interested in being an HMK volunteer, please fill out the form below or contact us. Some out our After-School Program students who are currently juniors and seniors in high school are beginning to focusing on their future endeavors of higher education programs and career mapping. In the past, the Hui Mālama O Ke Kai Foundation, Cultural Surveys Hawai'i, Manawale'a Riding Center, and Harold K.L. Castle Foundation have hosted Hui Mālama O Ke Kai students as interns. The students actively participated in their internships for three to six months. At the end of the program year, they shared their overall experiences with the entire HMK ‘ohana. If you and/or your organization are interested in hosting an internship with for our Alakaʻi, please contact us! HMK students spend an afternoon with ʻAnakala Hiapo at loʻi in Punaluʻu. Do you have something to share? Whether it is making lei, weaving lauhala, techniques on how to throw net or playing ʻukulele, the kids want to learn about it! If you have a talent, a passion, an experience or a hobby that you would like to share with us here at Hui Mālama O Ke Kai, we would love to have you as a guest speaker! Please contact us to talk story about possibilities!